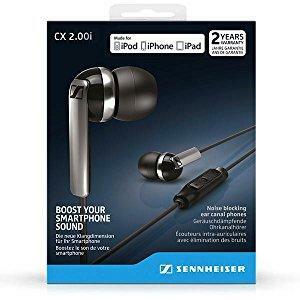 Sennheiser’s new CX 2.00 headsets will improve your smartphone sound. 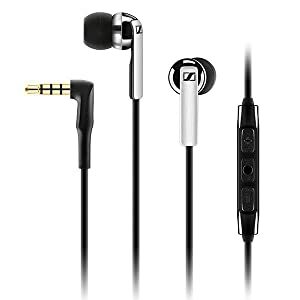 They deliver the balanced and vibrant bass-driven sound you’ve come to expect from Sennheiser products. Both of the CX 2.00 models (Apple iOS and Samsung Galaxy) feature a 3 button in-line remote with integrated mic, letting you answer calls and control music with just the push of a button. The CX 2.00 is the perfect headset when you are on the move. The CX 2.00 showcases Sennheiser design and engineering expertise. 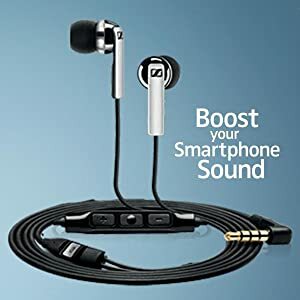 This in-ear canal headphone delivers clarity and balance across the frequency range, featuring extended highs, smooth mid-range and accurate yet powerful bass response. New acoustic design and driver technology delivers a lightweight, ultra-small form factor with great fit and performance. For user convenience the CX 2.00i is equipped with an integrated in-line remote control and microphone for taking calls and controlling music on Apple devices – iPhone, iPod or iPad. The same is true with the CX 2.00G for Windows Phone and Android devices, such as Samsung Galaxy models. 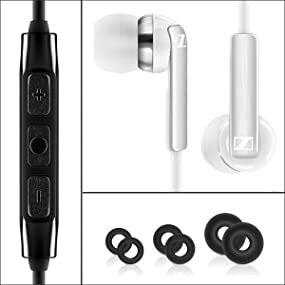 4 ear adapter sizes (XS, S, M, L) – for customized fit, effective noise blocking and improved sound quality. Anyone wanting improved sound quality from their smart phone, tablet or portable audio device. The CX 2.00i is compatible with Apple devices: all iPod, iPhone and iPad models. The full functionality of the Smart Remote Control is supported by the following models: iPhone 5S, iPhone 5C, iPhone 5, iPhone 4S, iPhone 4, iPhone 3GS, iPad mini, iPad (3rd generation or later), iPad 2, iPad, iPod touch* (2nd generation or later), iPod classic, iPod nano *,** (4th generation or later), iPod shuffle *,** (3rd generation or later). * Requires the latest iPod software. ** Only remote and voiceover functions. The CX 2.00G is compatible with the Samsung Galaxy devices: S series, Note series, Tab series and more.